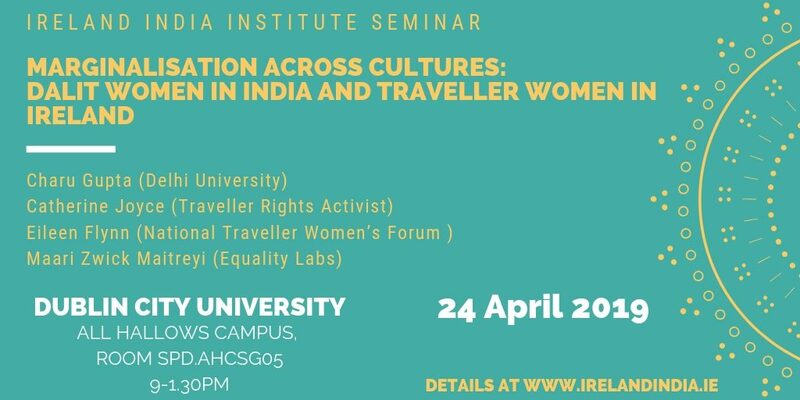 The Ireland India Institute is hosting a seminar ‘Marginalisation Across Cultures: Dalit Women in India and Traveller Women in Ireland’, bringing together Dalit activists from India and Traveller activists from Ireland, Wednesday 24 April 2019, in DCU All Hallows Campus. The speakers are Prof. Charu Gupta (Associate Professor at the University of Delhi, India), who’s written on gender and caste in her book titled ‘The Gender of Caste: Representing Dalits in Print’); Eileen Flynn is an activist and member of the National Traveller Women’s Forum; Maari Zwick Maitreyi is a Dalit activist, academic, and community organizer, and the co-founder of @Dalithistorynow; and Catherine Joyce, who is a manager in Blanchardstown Traveller Development Group. The objective of this seminar is to bring together activists and scholars from both countries working on the issues faced by women in these communities. Both communities have been subject to both institutional and communal discrimination and marginalisation with women shouldering a particular burden. The seminar will explore commonalities of experience, and build on this to promote change. The seminar is open to all but as space is limited registration is necessary. For registration, please email Dr Aurelie Sicard, aurelie.sicard@dcu.ie. This will take place is Wednesday 24 April 2019 at 9.00 (finishing at 1.30) in DCU All Hallows campus (room SPD.AHCSG05). If driving the main gate is in Grace Park Road (please note that is paid-parking once there and clamping is in effect), there is also a pedestrian entrance from Church Avenue, off Drumcondra Road.